‘Dar il-Kenn’, Triq Jannar, Xaghra, Gozo, XRA 102, Malta. This exquisite, detached villa is located in a quiet cul de sac and is ideal for guests looking for a peaceful holiday. The villa oozes with Gotizan charm and character and is only a five minute walk from Xaghra’s village square where there is a selection of restaurants and bars. 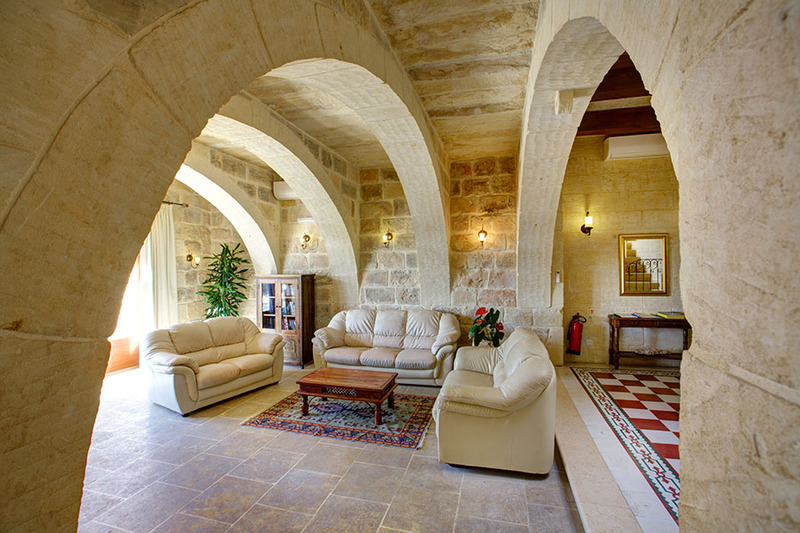 The interior of this fabulous villa is filled with charm and includes many traditional features such as limestone vaulted arches, solid wood furniture and exposed wooden beams. The large living room has a beautiful fireplace as its centre piece and a stunning stairway leading to the upper floor. The large farmhouse style kitchen has an incorporated dining area and views over the pool terrace. The villa has five bedrooms. Two twin bedrooms are on the ground floor. One of these bedrooms has an ensuite shower room and the other has access to a separate shower and toilet for disabled persons. There are three further bedrooms on the upper floor. Two of these bedrooms have double beds and one has twin beds. All of the bedrooms on the upper floor are spacious, comfortably furnished and have ensuite facilities. The pool terrace of this villa is truly superb. The sunbathing terrace surrounds the large 9.5m x 8m swimming pool which has an integrated Jacuzzi and ample patio furniture is provided to make the most of the fantastic weather. The master bedroom also has a private balcony which is perfect for private sunbathing. The villa is located in a quiet cul de sac just 300 metres from the Xaghra’s village centre and the pretty village square. There are a couple of local bars and restaurants in the square where you can enjoy a coffee and sit and people watch. Xaghra is also the location of Ggantija which is one of the oldest temples in the world. Nearby sights include the Xerri’s Grotto and Ninu’s Cave and the nearest beach of Ramla is just a 5 minute drive away. For guests staying longer than seven nights there is a weekly maid service. There is the option to have air conditioning in the villa. This is chargeable locally and can be arranged on arrival. It is essential to hire a car on this fascinating island. The roads are good and every kilometre brings a new and interesting surprise. We can supply a good selection of rental cars or jeeps.